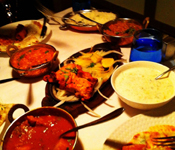 A trip to Chandigarh will get complete only after tasting their delicious and yummy cuisines. People of Chandigarh city are any time food crackers who prefer to taste striking cuisines with good amount of delectable spices. 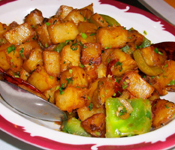 Similar to other places in Punjab state, the conventional cuisine of this Chandigarh city is spicy involving comparatively higher amount of ghee and oil. They don’t use any interesting sauces or complex soaking other than the exuberant usage of their spices together with extraordinary addition of ghee or oil. People in Chandigarh basically prefer wheat based food to rice. The well known wheat items among the large varieties are Makkee ki Roti (corn based chapatti) and also stuffed parathas. The food habits of the people of Chandigarh is a combination of traditional Punjabi cuisines like tandoori chicken together with chana bhaturas (gram curry which is very spicy with fried pastry beads), in addition to the lip-smacking fast food channels providing ice creams and burgers, along with affordable south Indian traditional dosas (lentil and rice pancakes), if not Chinese food items. 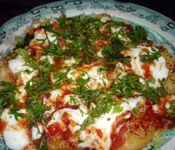 There is quite a good number of high-quality restaurants located in Sector-17 and also in up-market hotels. There are also few eateries in sector-22. One of the easily available items is alcohol, and there are few pubs situated in these two sectors providing beer on a tap but not on exiting cost. Milk and its substituent’s are generally preferred by Chandigarh people. They generally consume lassi, buttermilk and curd after a full course meal. People in Chandigarh commonly make use of ginger-garlic paste as their spicy component and also make use of large number of tomatoes and onion in their meal preparation. They also make use of spices present in ‘garam masalas’ which includes cinnamon, cardamom, and bay and mace leaf in their routine food preparation. Apart from this, they generally garnish the food with large amount of finely diced coriander leaves together with ginger juice. Bhuna Ghost (Lamb based Food item), Butter Chicken, Tandoori Chicken, Tandoori Fish, Amritsari Fish, Lamb Briyani, Chicken Briyani, Reshmi Tikka, Keema Naan, Pork Pickle and Malai Tikka. People in Chandigarh also prefer large varieties of flour and bread preparations. Few of the significant items are Tandoori Roti, Naan, Lachha Paratha, Kulcha, Chapatti or Phulka, Mooli Paratha, Aloo Paratha, Bhatoora and Poori. The population of Chandigarh prepares various kinds of sweet items to tempt the tongue. The prominent and quite different sweet is Roh Di Kheer, a dish prepared by boiling rice in the juice of sugarcane. Few of the other well known sweet dishes are Jaleb, malpua and baalushahi. One should taste all these sweets while visiting Chandigarh. Note: People at Chandigarh city welcomes their visitors with lip-smacking and yummy delicacies cooked with the traditional touch of Punjabi tadka. People residing in this city are die-hard fans of good and delicious foods and just simply throng on mouth-watering food items. Their food is generally spicy and also cooking items are soaked in ghee and oil. Curd, lassi and buttermilk are consumed every day after their main meal course. The city also saturates the tongue of non-vegetarians with good number of delicious non-veg items. One should definitely tour this city for a memorable and yummy experience!